The Omaha Railway Rolling Stock operated on the Hannibal from the early 1900's until Chicago and Northwestern Railway took the line over. CNW operations continued to Cornell until late 1980's servicing the paper mill, Co-op Feed Store and Fireproof Industries in Cornell and Falls Dairy in Jim Falls Wisconsin. Fuel, large commodities, and unique merchandise that was not truck worthy was delivered to these cities and paper products, fire resistant building panels, grain and milk products were shipped. Lumber was also an import and export based on style or composition of wood. When service reached a point that it was no longer profitable to continue service the line was decommissioned, and rails were removed for use other places, or scrapped for metal recycling. The history and research on the following pages are regarding the CStPM&O Hannibal Branch, the Wisconsin Ruby and Southern, and the Stanley Merrill and Phillips. 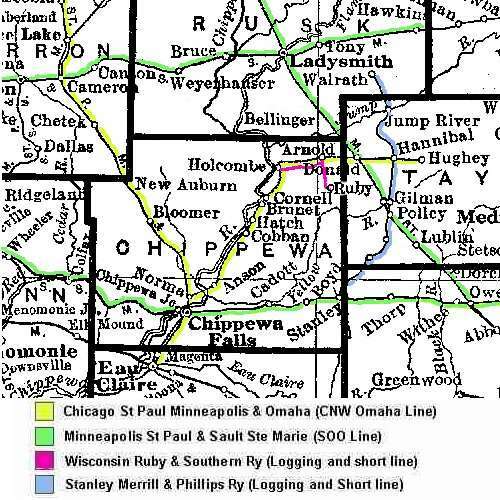 The Hannibal branch of the "Chicago ST Paul Minneapolis and Omaha" which later turned into the CNW (Chicago North-Western) ran from a town called Norma, just north of Chippewa falls, to a town called Hughey in Taylor County. Grand total of depot stops on this branch-line at one time was 12. The depots ranged from converted boxcars, wood frame, to brick buildings. A lot of goods were shipped out of the area such as logs, lumber, sugar beets, potatoes, and livestock. Some of the buildings still remain that once garnished the rails but most of them have disappeared over the last century. We are fortunate that memories, stories, and some pictures still remain to help in our gathering of information. The map above shows the subdivision from Norma to Hughey inside a polygon of CNW and SOO line. The map also shows the SM&P and the WR&S short-lines that crossed paths. 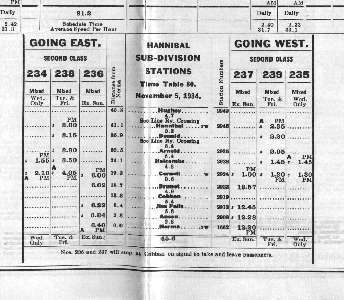 The timetable shown above shows travel time and distance between the two depots of Norma and Hughey. Built between 1900 and 1903, the Hannibal branch line was created. Stemming from the mid section of the "Omaha X" at Norma, the rails crossed the Soo line at Donald, crossed the Stanley Merrill and Phillips in Hannibal, to a town or at the very least a turnaround with sand and gravel access called Hughey 4.2 miles East of hwy 73. The track from Hannibal to Hughey of the CSTPM&O may have been abandoned in the 1930's. It was said that flood waters, (possibly by the Fisher River) took out a bridge or track that was never rebuilt to support the weight of a train. Another statement refers to a section of the track that was abandoned in 1943 when the tracks again were washed out between Cornell and Holcombe (Fisher river again). These reports may be the same natural disaster. Accuracy sometimes was best guess. Either way, a decision was made not to repair the tracks based on limited traffic north of Cornell. The remaining track from "Old Chippewa Junction" or Norma, now known as Chippewa Falls, to Cornell supported it's last train possibly in 1988. Eventually the rails were removed and it became the "Old Abe bicycle trail", as many abandoned railways have converted, and it remains very picturesque for the peddler or hiker. ...a few years ago I came across a postcard with an example of a "Hannibal & Chippewa Falls RPO". It was a fairly poor strike, but it's the only one from this line ever reported to the Mobile Post Office Society, a group that researches and publishes catalogs of RPO markings. 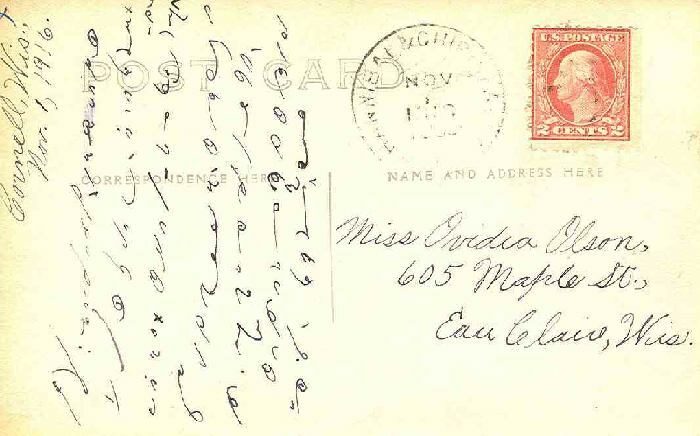 It appears to be postmarked on November 1, 1916, on Train 233. The front of the card is a real photo of the Cornell paper mill. (Many lightly-used branch line RPOs were discontinued around that time, as clerks were reassigned to heavier routes to handle wartime mail). 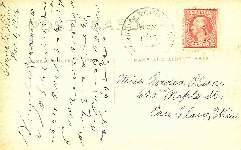 There are no known postmarks for the latter two designations. Judging from the late usage of my example, it's quite possible that the original postmarking hammer was used for the entire life of the run, without new ones being made, even though the name was changed in official post office records. 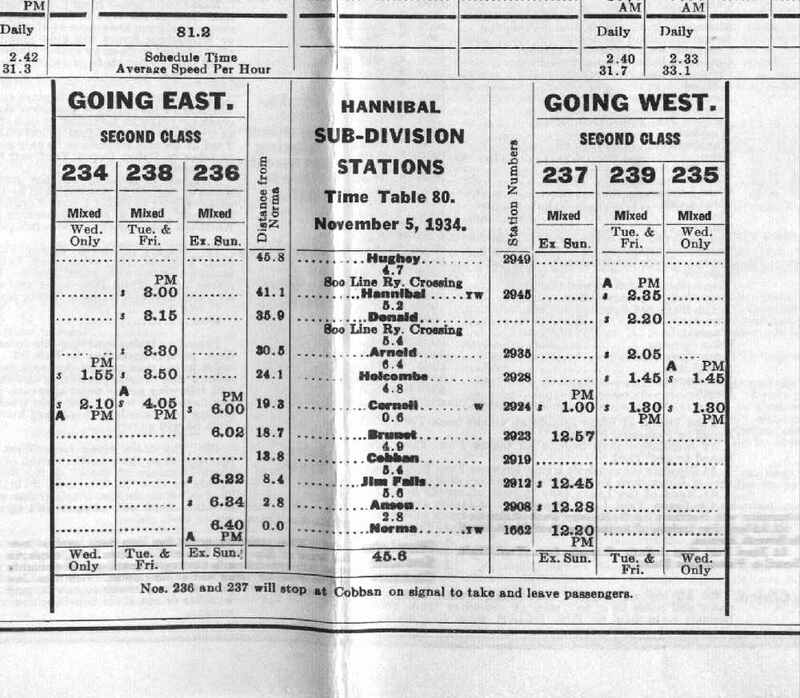 (Route history and dates from "Directory of Railway Post Offices" by John Kay, published by the MPOS). There was a short-line logging railroad that disappeared 12 years after the turn of the 20th century known as the "Wisconsin Ruby and Southern". This right of way ran from Holcombe to a Junction with the Omaha at Arnold, then to the Hawn lumber mill at Ruby. The town of Ruby, named after the daughter of the owner of the local log mill, is located halfway between Cornell and Gilman just north of hwy 64. It still remains in the form of an abandoned General Store, and a few houses. As kids, we used to pick cucumbers and sell them to the Ruby Store for spending cash. The SM&P short-line and common carrier ran North from Stanley, crossed the Soo line at Polley which is about one half mile south of Gilman, then crossed the Omaha at Hannibal and headed north to Jump river and Walwrath. 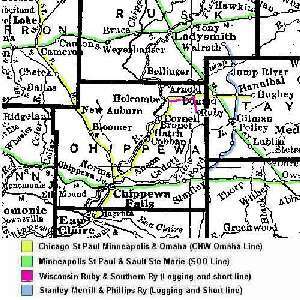 Financial issues forced the sale of the road to the Soo line in the early 20's starting with the section north of Gilman to Jump River, then the Southern section from Gilman to Stanley. The Soo then ran it for four years before they closed the traffic for good. The SM&P Ry was the reason the town of Stanley was built and the reason that we have Chapman Lake. Stanley was founded by three men who owned the Northwest Lumber Company. Stanley is where the lumber mill was built and a dam was built on the little Wolf River to create Chapman Lake as holding pond for the logs. The railroad was to run from Stanley to Merrill and then to its north end at Phillips. It was to run to up to Phillips from Stanley to pick up logs and bring them back to Stanley and dump into the lake until the mill was ready for them. However the tracks stopped in Merrill and never went to Phillips. If the mill in Stanley had have burned down in 1906, the railroad might have been finished all the way. When the mill burned down, it took the whole northern half of Stanley with it except for the company store and the city's water tower. It also scorched the city's library on the south side of the street that divided the fire ravaged half on the north from the south side, except for some minor damage to the library and two houses next to the library. A Mr. Chapman and Mr. Stanley founded the city of Stanley and the mill gave Stanley its first electric power. Stanley also and the railroad also have a connection with Sarah Palin. Her great great grand father lived in Stanley for a while and was the conductor for the S.M. & P. He and his wife are now buried in the city cemetery. This is all the information I know for right now, but I can tell you there is a historical marker of some sort where the lumber company once stood and the old depot in Stanley has been somewhat restored. And Stanley had a museum that I am sure has more information about this than what I can come with. They might even have a map of the route it took and it was supposed to take all the way to Phillips. You pretty much can still see where route went through Stanley. As the investigation is proceeding, memories are returning for me. Pictures and research play a massive part in prototypical model railroading. Model Railroading can be just watching trains run in an endless circle, point to point delivery, and for the hobbyist it also can be recreating the past. When new information is discovered, the opportunity to alter the layout arises. Gathering information can also be very challenging and exciting. Imagine stopping in restaurants, local saloons, businesses or city halls and talking to the local residents about things that happened, what the rails provided, and taking pictures of the pictures on the walls of businesses taken many years ago (most have them). Researching local libraries, and some small towns even have museums recalling many events and displaying many pictures from fifty to a hundred years ago. There are many pictures being placed in the pages and we have tried to optimize the load time for those of us with modems. Larger images are available for most by clicking on the smaller image and the pages to the menu is located between the railroad ties at the top of each page. If you have any information, stories, corrections, or pictures regarding this or any of the other towns along the Hannibal branch line, Please let me know, < E-mail > along with your permission to publish your personal memories in an attempt to keep the history available for future generations. Non-digital pictures will be returned upon request.